On Saturday, all eyes were on Phil Hellmuth as he went for his 14th bracelet in Event #7: AU$2,200 Six-Max No-Limit Hold’em at the 2014 World Series of Poker Asia-Pacific. However, poker history would have to wait as the “Poker Brat” exited in fourth place. 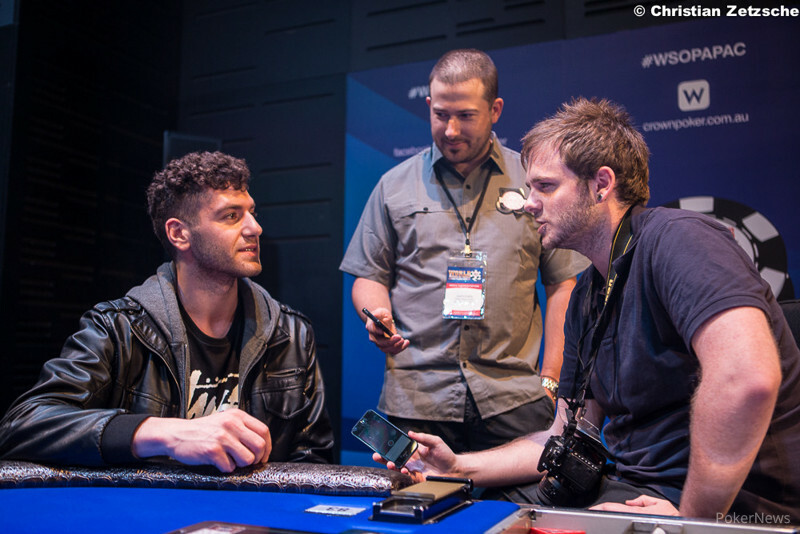 Instead, the day belonged to Australia’s Alexander “AJ” Antonios, who topped a field of 243 players to win the AU$128,784 first-place prize and coveted WSOP gold bracelet. The final six players took their seats at midday. 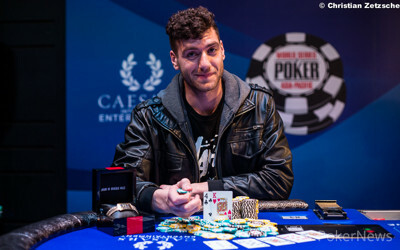 After just eight hours of play, Antonios, who plays cash games in Sydney, emerged as the last man standing. The first elimination of the day came early when Bruno Politano, who is a member of this year’s November Nine, got his short stack all in on Hand #7 of the final table. He was ahead with , but found himself racing against the of Hellmuth. Politano survived the flop, but a king on the turn gave Hellmuth the lead. Politano would miss the river and had to settle for sixth place and AU$19,809 in prize money. Five-handed play lasted a long time, but eventually Yu Kurita four-bet jammed pocket jacks and found herself racing against Michael Tran’s on Hand #69 of the final table. An ace on the flop was a dagger through Kurita’s heart, and by the time the board ran out, Tran had made a full house to send Kurita back to Japan in fifth place with AU$27,624. Hellmuth would fall 34 hands later when he moved his last 72,000 all in preflop holding the and was called by Tran’s . Hellmuth was flipping, but the proverbial coin did not come down in his favor as the board ran out a dry . Hellmuth was denied his record 14th bracelet and instead had to settle for fourth place and AU$38,909 in prize money. 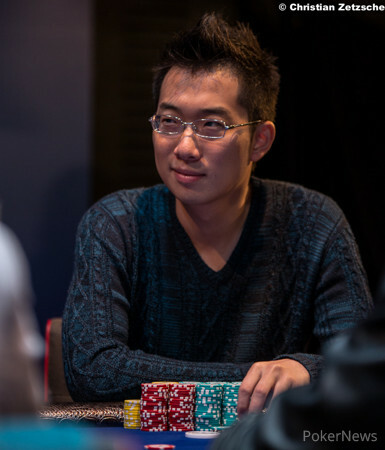 After more than three hours of three-handed play, action heated up on Hand #202 of the final table when Steven Zhou raised to 25,000 on the button, and Antonios called from the small blind. Tran came along from the big blind, and all three players saw a flop of . Two checks saw Zhou continue for 32,000, and then Antonios woke up with a big check-raise to 107,000. Tran quickly folded, and Zhou snap-shoved for 341,000. Antonios let an expletive slip his lips before asking for a count. After a minute, he dropped in some chips to create a monster pot. Zhou was ahead with a pair of kings, but Antonios was drawing to a flush in addition to his ace. The turn have Antonios added straight outs, but it'd be the river that would give him the win. The river sent Zhou home in third place for AU$79,646, while Antonios took a 6-1 chip lead into heads-up play. It took 23 more hands for Antonios to seal the deal, but eventually he did so when his held up against Tran’s in an all-in preflop confrontation. Congratulations to Alex Antonios on winning the 2014 WSOP APAC Event #7: $AU$2,200 Six-Max No-Limit Hold’em for AU$128,784 and his first WSOP gold bracelet. Hand #225: Michael Tran shoved his last 66,000 all in from the button and Alex Antonios made the call. Tran needed some help to extend his tournament life, and while the flop didn't hit him directly, it did give him an open-ended straight draw. The turn was a blank, and so was the river. Tran missed and had to settle for second place and a AU$79,646 consolation prize. Hand #218: Alex Antonios raised to 25,000 on the button and Michael Tran folded. Hand #219: Tran limped the button and then folded when Antonios raised to 36,000. Hand #220: Tran received a walk. Hand #221: Antonios got a walk back. Hand #222: Antonios raised to 25,000 on the button, Tran called, and the flop came down . Tran check-called a bet of 21,000 and then both players checked the turn. When the completed the board on the river, Tran bet 36,000 and Antonios called. Tran tabled the , but it was no good as Antonios had rivered two pair with the . Hand #223: Antonios received a walk. Hand #224: Antonios moved all in and Tran folded. Hand #213: Michael Tran raised to 28,000 and that won the pot. Hand #214: Alexander Antonios raised to 25,000 and quickly folded to a three-bet of Tran. Hand #215: Antonios limped the small blind, Tran checked. The flop was checked through and same applied for the on the turn. Antonios won the pot with a bet of 12,000 after the on the river completed the board. Hand #216: Antonios got through with a raise to 25,000. Hand #217: Tran made it 38,000 and Antonios said "take it" - fold. Hand #208: Alex Antonios raised to 25,000 on the button and won the pot. Hand #209: Michael Tran limped the button, Antonios checked his option, and then both players checked it down as the board ran out . Tran showed the , but it was no good as Antonios held the for king high. Hand #210: Antonios raised to 25,000 on the button and won the pot. Hand #211: Tran raised the button to 32,000, Antonios called, and the flop came down . Antonios checked and then folded when Tran moved all in for roughly 110,000. Hand #212: Antonios raised to 25,000 on the button and won the pot. Hand #203: Michael Tran raised to 26,000 and Alexander Antonios folded. Hand #204: Antonios limped, Tran made it 37,000 to go and Antonios called. They checked the flop and Tran bet 41,000 on the turn to claim the pot. Hand #205: Now Tran limped and called the raise to 37,000 by his opponent. The flop was again checked through very much like the previous hand. On the turn, Tran reluctantly called the bet of 28,000 by Antonios and both checked down the on the river. Antonios showed and the pair of sevens was good. Hand #206: Antonios limped and then bet the flop for 16,000. Tran mucked his cards. Hand #207: Tran raised to 28,000 from the small blind and won the pot. Hand #202: After hours of three-handed play a hand finally came that could very well determine the winner of this tournament. It began when Steven Zhou raised to 25,000 on the button and Alex Antonios called from the small blind. 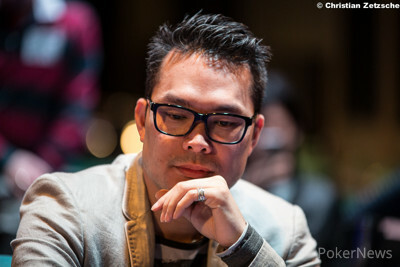 Michael Tran came along from the big blind and all three players saw a flop of . Two checks saw Zhou continue for 32,000, and then Antonios woke up with a big check-raise to 107,000. Tran quickly folded, and Zhou snap-shoved for 341,000. Antonios let an expletive slip his lips before asking for a count. After a minute he dropped in some chips to create a monster pot. Zhou was ahead with a pair of kings, but Antonios was drawing to a flush in addition to his ace. The turn have Antonios added straight outs, but it'd be the river that would give him the win. The river sent Zhou home in third place for AU$79,646, while Antonios takes a 6-1 chip lead into heads-up play. Hand #197: Michael Tran limped from the small blind, Steven Zhou raised to 37,000 and Tran released his cards. Hand #198: Zhou raised to 40,000 and Alexander Antonios called after some consideration. Zhou continued for 65,000 on the flop and 125,000 on the turn. Antonios called the first barrel but eventually let go after the second one. Hand #199: Antonios raised to 26,000 and Tran called out of the big blind. On the flop, Antonios check-folded to a bet of 28,000 by Tran. Hand #200: Antonios limped from the button, Tran called and Zhou checked. The flop was checked to Antonios and he took it down with a bet of 14,000. Hand #201: Tran raised the button to 25,000 and Zhou called the small blind. On the flop no bet was made before the fell on the turn. Zhou fired 27,000 and was called before he put in a hefty bet of 125,000 on the river. That was more than half the stack of Tran and the latter eventually mucked. Hands #25-26: "Of Course I Have a King, I'm Phil Hellmuth"
Will Phil Hellmuth Capture His Record 14th Bracelet Today?